This project allowed me to establish and implement a flipped learning component with supplement science content. 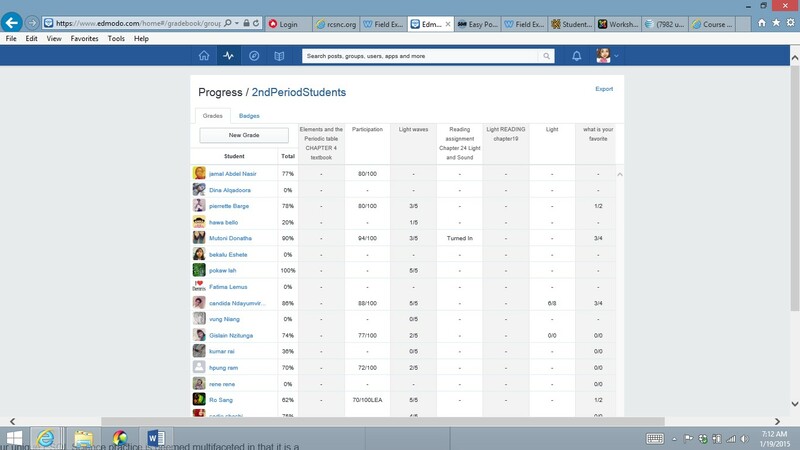 I selected an online interface, Edmodo, as an online learning platform. Over the course of the fall term, 2014, an increase in the use of student smart-phones made this project possible. Students participated on and off-campus in online content learning. While the majority of my students do not have access to the internet via a computer, most students have smart phones or temporary access to a family member's smart phone. Free communication services that are now available made it possible for me to design and organize an online component available to all students. My designed content component takes advantage of the Edmodo platform and the county access, in a manner that engages students in student-to-student group discussions, student and teacher feedback, and content assignments. Engaging student online provided students more opportunities to use first language input in content learning . My closed class Edmodo site stores content, resource links, and bookmarked web tools. This project demonstrates effective virtual classroom management and student participation. Specifically designed as a tool for learning outside of the face-to-face class time, my project enables me better engage with my students in the learning process. I use my iPad, smartphone, and an app to facilitate and assess online learning, and these tools allow me to frequently respond to student questions, give feedback on completed tasks, and make more immediate changes and submit additional content. The goal of the online component is to introduce science topic lessons and subject terms. Students are required to make interpretations and gain some background understanding prior to face-to-face instruction. The online tool for EL student use in science content instruction is unique in that it encourages students to gain content understanding in their first language and in English. This instructional strategy addresses the individual learner and can assist each student in building up to the needed level of content understanding for in-class topic discussion and face-to-face learning class time. Best pedagogy practices, such as repetition using more than one method for learning, along with online resources that support student learning objectives, such as interactive online activities, voice and reading web tools, and writing correction web tools resulted in positive preliminary evaluations. Classroom level content learning data, pre-post-assessments, prior to the use of this online component indicated an overall gain in student learning of 10%. Since including the online supplement component, the preliminary post assessments have indicated a 16% gain in student learning. More linear information is needed to determine the level of substantial impact blended learning has on student performance. I plan to explore the effectiveness of online science content learning further.